This blog entry about the events of Friday, July 30, 2004 was originally posted on August 07, 2004. Funny, the protesters that I took a photo of like a Yankee were protesting me. NOT EVERYONE IS HAPPY about the state of modern Russia. 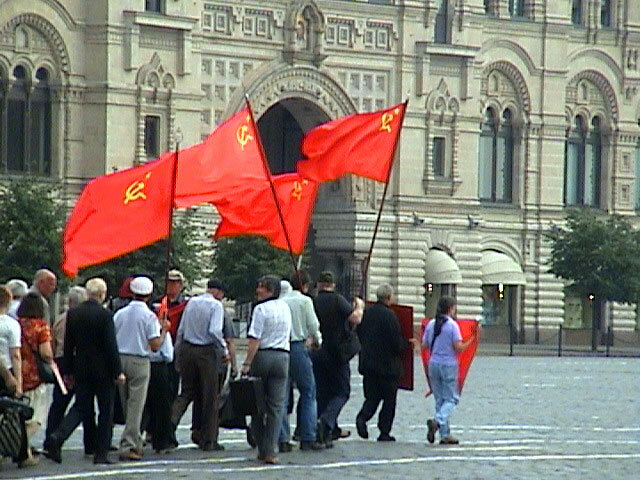 That morning in Red Square, a parade of people marched in, proudly waving the old Communist Soviet flag with the hammer and sickle (picture above). However, it didn’t stop the numerous couples of happy Russians posing for wedding photos. The current line of Moscow’s protesters didn’t inhibit us from seeing sights of Moscow’s past — nor did the passport control officers randomly checking people to see if they were officially registered to be in the country or not when I realized that if you get out of their walking path, they’ll avoid you. Sam and I started the day off inside St. Basil’s Cathedral, the church not built for Tetris’ title screen but by order of Ivan the Terrible in the 16th century in commemoration of his conquer of the city of Kazan to the southeast. St. Basil’s distinct Russian style was seen on the inside was well as out, with bright, eloquently painted walls in a multitude of colors of religious figures in the Russian Orthodox Church. From the inside of St. Basil’s, we went to the inside of the Kremlin, the epicenter of Russia’s government from the eras of tsars, Communist dictators and democratic presidents. The Kremlin was not one building but a complex of many surrounded by a fortification wall, most of which existed in present day from a reconstruction effort by order of Ivan the Great in the later 15th century, to replace the 14th century one that was destroyed. Inside the complex was more than the office and residence of the Russian president (off limits to the public); in fact there were more churches than government buildings behind the walls than anything else, all clustered near each other since the Kremlin used to be the center of the Russian Orthodox Church: the 15th century Assumption Cathedral, the Church of the Deposition of the Robe, the 15th century Annunciation Cathedral and the 16th century Archangel Cathedral, the resting place of many deceased tsars. In addition to the churches were palaces and the 16th century Ivan the Great Bell Tower, where the original bell never rang after it fell to the ground. The Kremlin was interesting but crowded with tourists. One thing I noticed was that security wasn’t as tight as I thought it’d be — although the security guards really questioned why I was “dancing” when I was trying to swat a bee away from my stomach. “HOW MUCH DO YOU THINK THE BALLET IS?” I asked Sam as we wandered around with our cameras in the Teatralnaya Square, home of the famous Bolshoi Theater. For the summer, the Bolshoi was under renovation, so The Russia National Ballet Company was performing at the smaller theater nearby in the same Bolshoi complex. To make a long story short, about an hour later we were sitting in the orchestra section to see Tchaichovsky’s “Swan Lake,” the famous ballet that bombed in its opening but stood the test of time and prevailed. Men in tights and women in tutus stood on their tippy-toes in graceful fashion, telling the story of Prince Siegfried trying to find his true love, who had been turned into a swan by a bad guy — who didn’t look so evil wearing pantyhose. Moscow’s hot summer temperatures took its toll on the non-air-conditioned theater and most of the audience — including Sam — couldn’t stop nodding off. ST. BASIL’S WAS LIT UP as we saw from the view from our hotel room when we stopped in to freshen up. Having done the American meal the night before, it was time to go Russian at the Cafe Kartenydvor, a traditional Russian place with rustic decor that was obviously good since the prices weren’t inflated and the locals ate there. We had already done the Russian thing by drinking beers in public — contrary to Western thought, beer is more popular that vodka in Russia — so I tried a regional Georgian wine with my three course Russian meal: salmon caviar, borscht (beetroot soup with meat, vegetables and sour cream), and a sturgeon fish shishlik. AS WE LEARNED THAT DAY, there may be debates between supporters of old and new Russia, but as we walked passed the looming shadow of the Marshall Zhukov statue near Red Square, we knew that protest rally or not, Russia’s history, culture and customs of the past would never fade away. Oh, I can’t even look at caviar after AR5! Borscht…. mmmmmmmmmmm. You’re making me hungry! ERIK - i hope you get a better cut than that…haha.. SO awesome. Thanks SO much for the Moscow update. I haven’t read the few before this, or the ones after - yet - but had to read the part about Moscow. I want to go back there, so badly. You’ve made me realize how much I miss speaking the language! Thank you!!! Borscht, yum. And you saw Swan Lake at the Bolshoi? Stinker!! The bell is much bigger than I had thought - did you think that too? I stood next to it also! Wanna go back… thank you for the pictures to tide me over, I’ll read the rest of the updates soon. The “Looming Shadow” pic gave me chills. Russia’s equivalent to “big brother is (still) watching you”. SIM - you like the teenage young tennis stars huh? now who’s r. kelly, huh? Markyt: uhhmmm, the Olsen effect my brother ... I think Webster’s added the new word “teensploitation” to its Dict. SIM - ok ok…i ain’t mad at you….so when you coming to NYC in the fall to go to classes at NYU with the Olsen twins? When you went into the Kremlin, which way did you go in? Did they have the gate off Red Square available? So many fun memories. Good story, great pics from inside the cathedral. I’m glad to see it isn’t all military and dismal. Food looked yummy too! NOELLE: Actually, I didn’t know what to expect of the bell—or that it was there until I got there for that matter… Getting into the Kremlin was from the bridge gate on the west, and yes, in the daytime, for most of the time, Red Square is gated off… The only way to the other side is through the GUM mall—perfect marketing strategy! Hmm, I just had thought it would be smaller, even after all the accounts by my teachers. Live and learn, eh?